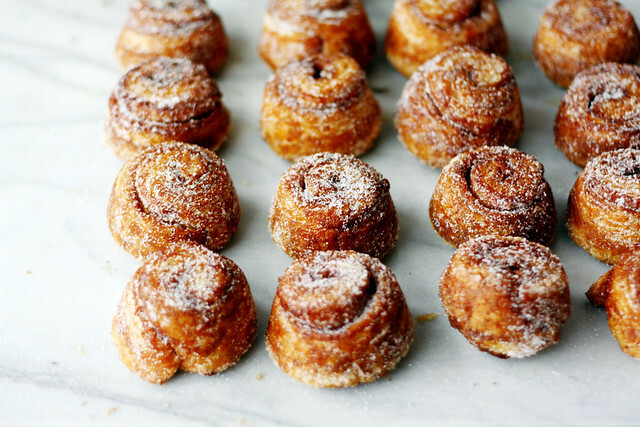 When leafing through The Violet Bakery Cookbook by Claire Ptak last week, I kept coming back to the page for her cinnamon buns. If you've been around here for a while, you might know that one of my favourite breakfast pastries are sugar buns (Tartine Bakery's morning bun made with a whole-wheat variation on Nigella Lawson's Danish dough, and laced with almond and orange). Besides bostocks, they are usually my holiday morning go-to, and it is rare that I stray from that habit. However (! ), Ptak's recipe is made without yeast; the dough gets its rise from baking powder instead, like the cousin of a scone or sweet biscuit. That was enough to intrigue. Plus they were pretty; perfectly golden arabesques dusted with sugar. Total lookers. So curiosity got the better of me. You make the dough in a stand mixer, crumbling up cold butter into the dry ingredients, then adding milk until a dough curls up around the paddle. Simple. The dough rolls out smooth and supple, twirls back up into an impressive swirl, then bakes into delicate layers with just a touch of elasticity for some chew. 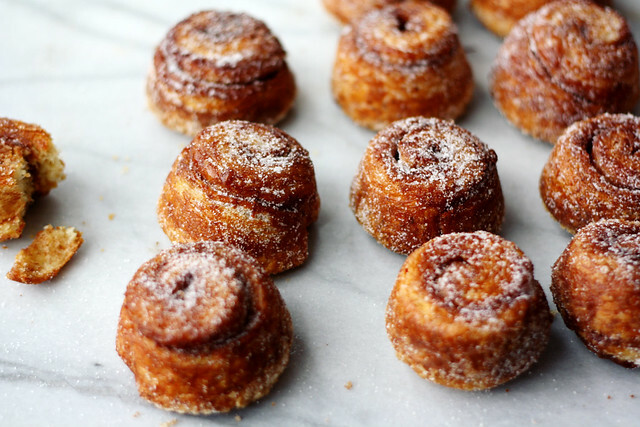 The cinnamon swirl is backed up in spice by some cardamom in the dough and the combo comes off friskier than either on their own. It's exactly right. And, if you can find Ceylon cinnamon, this is the time to use it. It's Thanksgiving coming up, and we are going apple picking sometime this week — I'm toying with the idea of a second go with these for the holiday weekend, this time wafer thin slices of sautéed apples and blitzed almonds wrapped up in the coil. I think that might be a good idea. Still, I didn't want to hold out on you on the recipe, so here they are. Happy start of the week, talk soon. "Of course a soft yeasty bun can be a wonderful thing, but at Violet we have never had enough space to work with yeasted bread doughs. They take up more room and need larger machines. I came up with these yeast-free buns in my home kitchen by looking back through the cookbooks of the 1950s, when everything was about how to make things more quickly. Quick breads, as breads leavened with baking powder or baking soda are called, were an alternative to the time-consuming yeast or sourdough breads. Truly, they are something altogether different. They both have their place on the table. This recipe can also be made ahead then frozen in the muffin tin until ready to bake." Preheat the oven to 200°C/390°F (180°C/355°F convection). Butter a 12-cup deep muffin pan. First, prepare the feeling. Melt the butter and leave in a warm place so that it remains liquid. Mixed together the light brown sugar and cinnamon until no lumps remain, then set aside. Now make the dough. In the bowl of a stand mixer with a paddle attachment, combine all the dry ingredients with the cubes of butter and mix until you have a coarse meal. Slowly pour into cold milk while the mixer is running, until dough forms into a ball and comes away from the bowl. Turn the dough out onto a lightly floured surface and leave to rest for a few minutes. Fold the dough gently over itself once or twice to pull it all together let the dough rest a second time, for 10 minutes. Clear a large surface, dust lightly with more flour, and roll out the dough into a large rectangle until almost 5mm (1/8 inch) thick. Brush the surface of the dough with the melted butter and, before the butter hardens, sprinkle the cinnamon sugar on to the butter. You want a good, slightly thick layer. Now roll the long side, keeping it neat and tidy. 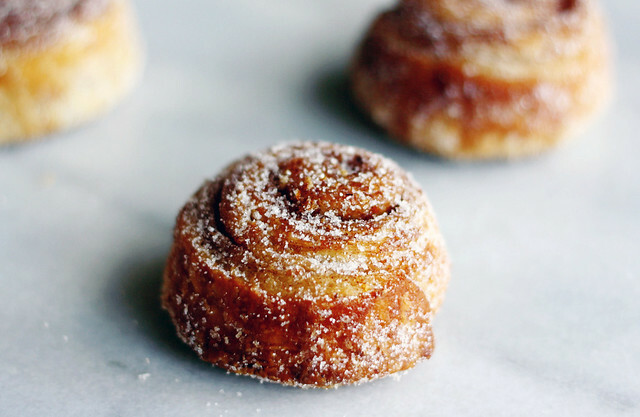 Gently tug the dough toward you to get a taut roll while rolling away from you in a spiral. Once it’s all rolled up, gently squeeze the roll to ensure it’s the same sickness throughout. Use a sharp knife to cut the roll crosswise into 12 even slices. Take a slice of the cinnamon roll, peel back about 5 cm (2 inches) of the loose end of the pastry and fold back under the roll too loosely cover the bottom of the roll. Place in the muffin pan, flap side down. Repeat with remaining slices. Bake the buns for 25 minutes. As soon as they're out of the oven, flip them over onto a wire cooling rack so that they don't stick to the tray. Dip each cinnamon bun into a bowl of sugar and serve right away. There seems to be an error in the volume conversion in the book for this entry — the flour is listed as 560g or 1 1/2 cups, but that weight is actually about 4 1/2 cups and I've changed the recipe to reflect that.